Thought for the day: Patterned lists of equations can help students discover meanings and make connections. I notice four subtraction equations. I notice that the only numbers are 0, 1, 2, 3, and 4. I notice that the answer is always on the left. I wonder if that matters. I notice patterns in the equations. The first number on the right (minuend) stays the same. The number being subtracted (the subtrahend) goes down by 1 each time. The answer (difference) goes up by 1 each time. I wonder if these equations mean something. I wonder if the difference will always go up by 1 when the subtrahend goes down by 1. I wonder what happens to the difference when the minuend goes up by 1. I wonder if the pattern keeps going when I put more equations into the list. I wonder what causes the pattern. I wonder what happens if the minuend or subtrahend go up or down by other amounts. I notice that the 1 and the 3 trade places in two of the equations. I wonder if numbers will always trade places when I keep the pattern going. Create lists using minuends other than 4. Create lists in which the numbers they are subtracting increase or decrease by different amounts. Draw pictures that illustrate some of the patterns that they discover. Create stories (real-world or imaginative) to fit their lists of equations! I notice that comparing equations helps me learn new things. I wonder if I can make more patterns by fitting equations between the equations in the list. I wonder if I can always predict how differences will change just by looking at changes in the minuend and subtrahend. I notice that if I extend the pattern up and down at the same time, then equations that are the same amount above and below 2 = 4 – 2 always have numbers that trade places. Seeing equations written in a variety of formats (horizontally and vertically, differences on the right and left, etc.) helps students to focus on ideas rather than just the appearance of the symbols on the page. Exploring equations that are already complete (rather than just "finding answers" to incomplete equations) helps students realize that math is about understanding ideas as well as getting answers. 18 – 10, or even something like changing 113 – 99 into 114 – 100. Students may wonder if these equations are still true. It turns out that they are! The ideas of "how much more" and "counting up" can be great ways to think about subtraction with negative numbers (probably more helpful than the "taking away" idea). For example, in the second equation, you can ask, "How much more is 4 than -1?" or "How far do you have to count up from -1 to get to 4?" Either way, the answer is 5! One above and below 2 = 4 – 2: 1 and 3 trade places. Two above and below 2 = 4 – 2: 0 and 4 trade places. Three above and below 2 = 4 – 2: -1 and 5 trade places. 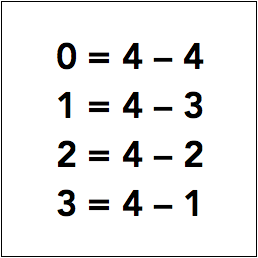 Four above and below 2 = 4 – 2: -2 and 6 trade places. Subtraction "fact families" appear to extend to equations with negative numbers!